How Often Should You Seal Pavers? 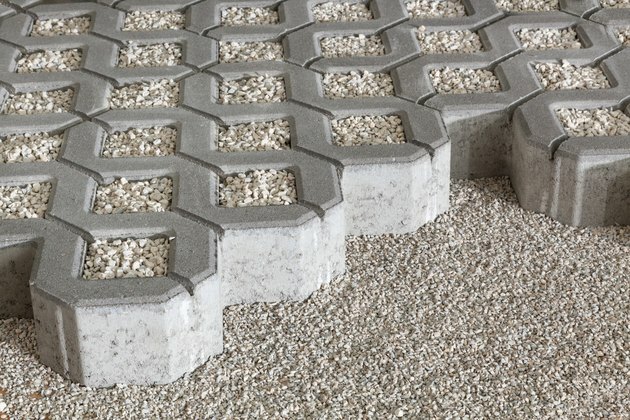 Far from boring, always durable and awash with design options, concrete pavers are a beauty to behold. The pavers themselves can lose their luster after just three to five years of being subjected to inclement weather, bike and car tires and the harmful rays of the sun beating down on them through the seasons, dulling the color. Resealing outdoor pavers is a fairly straightforward process that requires a minimum amount of skill and tools and a few days of good weather. Although paver patios and outdoor areas don't require annual cleaning, staining or other maintenance, they do need a little love every few years to keep them looking lustrous. A water-based sealer will harden the sand in the joints and keep it from washing out and letting ants and weeds move in. Some sealers can provide a high shine to your pavers for a wet look, which also highlights their color and creates a vibrant appearance. The right sealant will also protect the pavers from rain and UV rays that fade the color. Pavers add value to your property, but only if they continue to hold their rich sheen. After about two years, they can begin to look faded. It doesn't hurt the pavers to have a fresh coat of sealant two years after first applying a sealant if the fade is obvious. A sure sign you need to reseal a patio or outdoor paver area is when weeds begin to take root in the joints between the pavers. If they begin to buckle or rise, the paver area is offering up a signal it's time to reseal. With a mild soap solution, power wash the paver area and remove any stains, such as rust from patio furniture or caked dirt from wood piles. Masonry cleaner removes rust quickly. Clear away any cleaner with a final power wash of plain water. Level out uneven bricks by pulling them up and adding or removing sand to make an even surface. Refill all of the joints between the rocks by applying a layer of sand and brushing it across the paver surface. Once the area is prepped, properly apply a coat of water-based sealer with a portable garden sprayer featuring a tank and nozzle large enough to handle the viscous sealant. This will get the sealant to cover the joints and pavers evenly. You can also brush or roll on the sealant. Be careful not to let it build up in the joints, so apply it lightly over two coats. Can Brick Pavers Be Stained Another Color?